American Samoa is a group of islands located in the South Pacific Ocean. It is an unincorporated US territory, but its inhabitants are not called US citizens but US nationals. Like any other destination in the South Pacific, American Samoa is ideal for your vacation if you are looking to sit on the beach and relax all day long. The beaches are beautiful, and the water is perfect for bathing. However, beaches are not the only attraction in American Samoa. You can also go and explore the islands. We recommend that you go hiking in the rainforest in the mountains. For a gorgeous view, the top of the Mount Alava is where you want to be. It is a 2-hour hike, but it is worth it. Before you travel to American Samoa, you need to see whether or not you need a visa. As you can imagine, US citizens and nationals do not need a visa to enter American Samoa, but they do need a passport. At the same time, some eligible nationalities can travel to American Samoa and obtain a visa on arrival that allows them to stay inside the territory for up to 30 days. Extensions are possible, but they are challenging to get. All the other visitors must go to the nearest US embassy. To check if you are among the eligible nationalities for a visa on arrival, you can look up American Samoa’s visa policy and read about it there. However, we suggest that you use iVisa’s Visa Checker. All you have to do is click on the Visa Checker button you see in the top right corner and fill in the boxes. You must select your nationality from the drag-down menu on the left, and on the right, you must choose American Samoa as your destination. The result will tell you if you need a visa or not, and if you do, you will be given some useful information such as a list of the nearest embassies where you can apply. iVisa does not process American Samoa visa application at the moment, but if that changes, we will let you know. 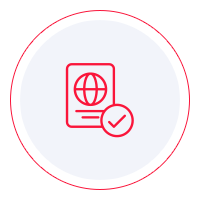 In the meantime, if you have any questions related to this visa, you are more than welcome to contact our support service. It is available 24/7, and it is free of charge. The next thing you need to check out is the visa requirements for American Samoa. You can find a lot of information online, but we advise you to use it as a reference only. The info you see online is not always the most reliable. In consequence, we recommend that you call the issuing authority and ask your questions there. They can give you the most legitimate answers. Meanwhile, what we can tell you is that all travelers who take a trip to American Samoa need to have a passport that does not expire for at least another 6 months from the date of arrival. Even if we cannot help you get your visa for your trip to American Samoa, we hope that the application process at the embassy is hassle-free and that the information above is useful.